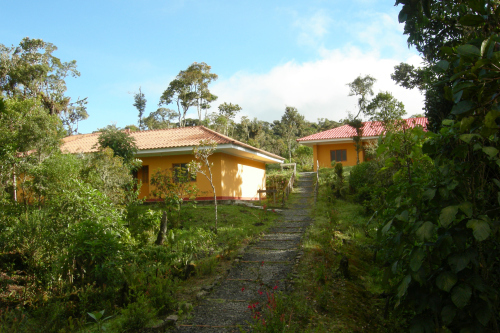 The Owlet Lodge is situated in Abra Patricia Conservation Area in the cloud forest of the Amazonas Department in northern Peru. The Alto Mayo Forest, a key area on the so-called Northern Peru Birding Route, is close by. Tarapoto Airport is about 4 hours away. The lodge is named after the endangered Long-whiskered Owlet which guides from the lodge can take visitors to see. Other special birds, from many, locally include Ochre-fronted, Undulated and Pale-billed Antpittas, Common and Andean Potoos and various hummingbirds. The Critically Endangered Yellow-tailed Woolly Monkey is also present. The lodge facilities are designed for birders, with a restaurant, en-suite bungalows, marked birding trails and feeders to attract birds to photographers. Importantly, staying at the lodge directly supports the conservation of the area.